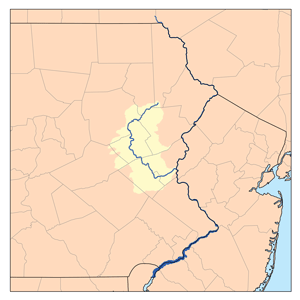 The Lehigh River, a tributary of the Delaware River, is a 109-mile-long (175 km) river located in eastern Pennsylvania, in the United States. Part of the Lehigh, along with a number of its tributaries, is designated a Pennsylvania Scenic River by the state's Department of Conservation and Natural Resources. "Lehigh" is an Anglicization of the Lenape name for the river, Lechewuekink, meaning "where there are forks". The river flows in a highly winding course through valleys between ridges of the Appalachian Mountains. Its upper course is characterized by numerous whitewater rapids and supports a broad range of recreational pursuits including whitewater rafting, kayaking and canoeing. Its lower course forms the heart of the Lehigh Valley, a historically important anthracite coal and steel-producing region of Pennsylvania. The river rises in the Pocono Mountains of northeastern Pennsylvania, in several ponds in Lehigh Township, Wayne County, approximately 15 miles (24 km) southeast of Scranton. It flows initially southwest, through southern Lackawanna County, through Francis E. Walter Reservoir. Near White Haven it turns south, following a zigzag whitewater course through Lehigh Gorge State Park to Jim Thorpe, then southeast, past Lehighton. Southeast of Lehighton, it passes through Blue Mountain in a narrow opening called the Lehigh Gap. From the Lehigh Gap, the river flows southeast to Allentown, where it is joined by Little Lehigh Creek, then northeast past Bethlehem, where it joins the Delaware River in Easton, along Pennsylvania's border with New Jersey. The PA Gazetteer of Streams shows that the Lehigh River begins as the outflow of Pocono Peak Lake. Flowing south from the south end of the lake (a natural but dammed body of water) it turns west after a mile and receives water from many lakes and ponds as it flows past the borough of Gouldsboro. The Lehigh River holds many species of fish, such as trout, smallmouth bass, largemouth bass, pickerel, panfish, carp, catfish and muskellunge (muskie). Trout, both rainbow and brown in the 18"-20" range are average while some have been caught into the mid to upper 20" range. Smallmouth bass are large in numbers but are of smaller size with most between 8"-14" with an occasional fish from the 18"-21" range. There is an increasing number of muskie being reported within the 30"-52" range. There are both pure and tiger muskie, the usually sterile, hybrid offspring of the true muskellunge (Esox masquinongy) and the northern pike (Esox lucius) being caught in the river. ^ a b "PA DCNR - Lehigh Gorge State Park". www.dcnr.state.pa.us. Retrieved 2015-11-16. "Fast Facts About Lehigh River". Lehigh Earth Observatory's Envirosci Inquiry. Archived from the original on 2008-05-16. Retrieved 2008-05-05. Wikimedia Commons has media related to Lehigh Valley. Wikimedia Commons has media related to Lehigh River. Wikisource has the text of the 1905 New International Encyclopedia article Lehigh. This page was last edited on 19 November 2018, at 00:26 (UTC).